"Wildlife land plans raise doubts"
The Denver Post ran an informative article on today's front page about federal plans to reduce protection for Colorado's designated "Roadless Areas." This could have serious impacts on fish and wildlife resources. 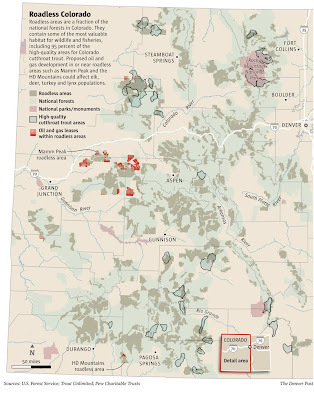 "The proposed rule to manage Colorado's 4.1 million acres of roadless forests raises "potentially higher risks" for wildlife and fisheries, according to a federal analysis. The U.S. Forest Service's draft environmental-impact statement on the rule estimates there could be higher risks for wildlife in 118 of the 345 roadless areas in the state. Natural fisheries in 44 roadless areas would also face potentially higher risks compared with a more protective rule, according to the environmental assessment. "These areas are vital to preserving a natural resource and what is left of Colorado as it was 100 years ago," said Chris Hunt, a spokesman for Trout Unlimited, a national conservation group.